US, 1977, 113 minutes, Colour. Marsha Mason, Anthony Hopkins, John Beck, Susan Swift. girl, Anthony Hopkins and Marsha Mason doing their best as tormented adults and John Beck as one of the most obnoxious of screen fathers. This is a reasonably interesting film of its kind. A comparison could be made with The Reincarnation of Peter Proud. 1. The 70s interest in the supra-natural? The place of this film within the genres? Thriller, excitement? Plausible, realistic, fiction? 2. The focus of the title on the girl's name? The mysterious name for Ivy? The indication of reincarnation? 3. The importance of the modern atmosphere for the plausibility? Colour, the presentation of the city, the world of apartments, schools? The ordinary world in comparison with the world of the psyche? The atmosphere of the initial accident, the court room, the demonstration hypnotic session? The contribution of the music and the special effects? 4. Audience presuppositions about reincarnation? Its possibility, impossibility? The plausibility of reincarnation as explained in this instance? The testimony of the gurus, especially during the court session? The experience of the ending? The macabre aspects of one person occupying another? The nature of the soul, of existence, of personality? Enjoyment for a person who believes in reincarnation? For a person who does not? 5. The pros and cons of the experience of reincarnation? The film's seeming support of it, interest in the story, the straightforward way it was presented, the plausibility of the facts as presented, the quotation from the Bhagavad-Ghita? at the end? Yet the warnings against reincarnation because of the macabre experiences and Audrey Rose's death? 6. The tone of the prologue, the death of Audrey Rose? Its recapitulation in Ivy and her dreams and nightmares and experiencing Audrey Rose's death? As recapitulated and visualised during the hypnosis session? The ghastliness of Audrey Rose's cries, burning? As verbally described by witnesses? As lived in Ivy's nightmares? 7. The Templeton family as an ordinary family, city people, Americans, their lifestyle and values? The initial sequences of them enjoying themselves? The ominous presence of Elliott Hoover and his watching? Bill at work, Janice and her care for Ivy? 8. The presentation of Ivy? 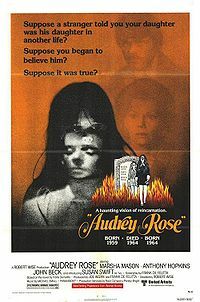 Susan Swift's skill in presenting the complex nature of Ivy, innocent, possessed by Audrey Rose, becoming Audrey Rose? The ordinariness of her life., her birthday, presents etc.? 9. The enigmatic figure of Hoover? His ominous presence, following the family, watching Audrey Rose? His appearance, in the rain etc? Janice's fears, her accident and her anger with Audrey Rose for going how without her? Bill and his fear and his explanations to the police and their inability to help? The audience sharing their worry? 10. Hoover and his phone call and revealing himself? His change of appearance? Audience curiosity about his story and interest in his explanation? Marriage, child, the accident? The scene in the restaurant and the sudden rushing home for Ivy? His presence, especially for Ivy and calming her down by calling her Audrey Rose? Bill and his hostile attitudes and the credibility of this? His going out and leaving Janice alone and her desperation, her refusal of Hoover's help, her desperate reliance on him? Her resenting his presence, her pain at losing her child? Yet her desperation in needing him to help Ivy? The effect of his final intervention and his swift movements in kidnapping Ivy? His promises that he wouldn't intervene, the gradual encounter with Ivy as Audrey Rose, his dependence on her and wanting her? Where did audience sympathies lie? 11. The sudden transition to the court sequences? Change of mood, atmosphere? The personality of the judge and his attitude towards the case, the two counsellors and their attitude towards their clients, trying to win their cases? The atmosphere of the courts, the sensational headlines? The witnesses, especially the explanations about reincarnation, the lady involved in the accident? where did audiences want the judgement to be given? 12. The experience of the court case and the growing estrangement between Bill and Janice? Bill and his obtuseness and obstinacy? How credible? Why his lack of sensitivity towards Janice? Janice and her experience of the case, her love for her daughter, her growing faith in Hoover? Her changing of opinion and her testimony? 13. Ivy and the complexities of the case? Her life in the convent, the visit of her parents, her being drawn into the fire? The hospital sequence and the nun's explanation and Bill's anger? 14. The repercussions of the change in Janice? Her attitude towards Ivy, towards Bill? Towards Hoover? Her placing her faith for her daughter's recovery in Hoover? 15. The build-up to the test? The legal guarantees? The medical guarantees? Bill and his decision, Ivy's wishes? Hoover's wishes? Janice's hostility? The set-up of the test, the two-way mirror, the television circuit and Janice's watching it? The dangers? The control, the lack of control? The experience of Ivy, going back to her various stages? The impact of this experience of going back under hypnosis? The going back into the experience of Audrey Rose and her being trapped within that experience? Her parents trying to save her? The pathos of her death? The philosophy that for a birth there must be a death? 16. The significance of the final quotation from the Bhagavad-Gita? 17. The thriller techniques, the atmosphere of the 70s and interest, in Eastern religions, reincarnation? Audience interests in the transcendent? The presentation of the ordinary world, people without transcendent values? Complacent human values being broken into by such transcendent experiences?